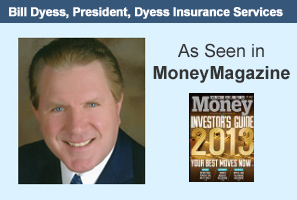 At Dyess Insurance Services, you will have the latest knowledge given to you by an Industry Expert. You will be given all the time you need to understand the different policies available that might be beneficial to you. It doesn't stop after you apply. You will have every chance to have your questions answered. All the mystery surrounding Life Insurance, Long Term Care and Annuities will be made easy for you. Our relationships with different insurance companies will make access to information quick and efficient. William Raymond Dyess (pronounced Die-Ess) was raised right outside Ithaca, New York. Born the second son of Pat and Jim Dyess, he was one of six children. Four sisters later the family was complete. Bill became interested in Football as a young man and threw himself into the sport. There, along with his strong family values, he developed his work ethic, becoming the Most Valuable Player his Senior Year at Ithaca High School. Following High School he went to Dean College in Franklin, Massachusetts. From there, he was accepted into University of Miami in Coral Gables and became a Miami Hurricane Football Player. As for his academic studies, he majored in Business Administration with a minor in Political Science. Coming from humble beginnings, Bill learned early in life to GIVE and to SAVE. These life lessons shaped his personality and helped him become the business man he is today. Along the way, he convinced his Mother to buy herself, long term health care insurance never knowing that it would provide her the care she needed and an independence she wouldn't otherwise be able to afford. You see, his mother developed COPD-Chronic Obstructive Pulmonary Disease. She needed to have Lung Reduction Surgery which prolonged her life, but made it very difficult for her to live on her own. Thankfully, she was prepared because of her son's emphasis on having a Long Term Care Policy and is living a life that is independent, with the care she needs that does not burden her family. Bill has dedicated his life to understanding how to prepare for the future needs of his family and that of many others. He is a Long Term Care Specialist and is often sought out by different organizations to speak, to educate and to provide assistance for those in the field. He is also well versed in Life Insurance and Annuities. Bill is very skilled at using these tools to prepare for the future and to create opportunities to save on taxes. Based on his clients needs he offers Life Insurance Policies that are basically creditor proof. He also uses Annuities as a vehicle for people who want to invest and to have a guaranteed income for life. His career spans thirty-five years. Bill is a Nationally Recognized Speaker in the Long Term Care Industry. Bill has received the Stanley Greenspan Memorial Award, "Health Person of the Year ", which is the highest achievement from the local Health Underwriters Association. He is also past President of the Miami and Ft. Lauderdale Health Underwriters Associations. Currently Bill serves as a board member of the Greater Ft. Lauderdale FPA, Financial Planning Association. He holds the highest Long Term Care designation in the Industry, CLTC. Bill gives back in every way he can by being involved as a board member of the Weizmann Institute. He is also very interested in science and he supports his Miami Hurricanes and other charities. He runs his company the way he does his life- with honesty and integrity.